Support Bands & Cradle are required for this tank. Ace Roto-Mold 400 Gallon Elliptical Tank, part# HE0400-57 is a white portable cradle tank. It's primarily used for the storage and transportation of water and chemicals. This Elliptical Tank is used in a variety of industries such as construction, auto detailing, manufacturing, agriculture, fire suppression, lawn care, and pest control. It's commonly used for hauling chemicals, diesel exhaust fluid, fertilizers, and water in non-DOT applications. The tank is often mounted to trucks, trailers, tractors, ATV's, and agriculture equipment. This plastic Elliptical Tank is constructed with rotationally molded polyethylene resin. It's seamless construction makes it durable and resistant to cracks, chips, and ruptures. The poly skid tank was made with FDA approved resin that complies with FDA standards 21 CFR 177.1520 (1) 3.1 and 3.2 for the storage of potable water. It's made with UV inhibitors that help protect liquid contents from direct sunlight - making it ideal for both indoor and outdoor use. 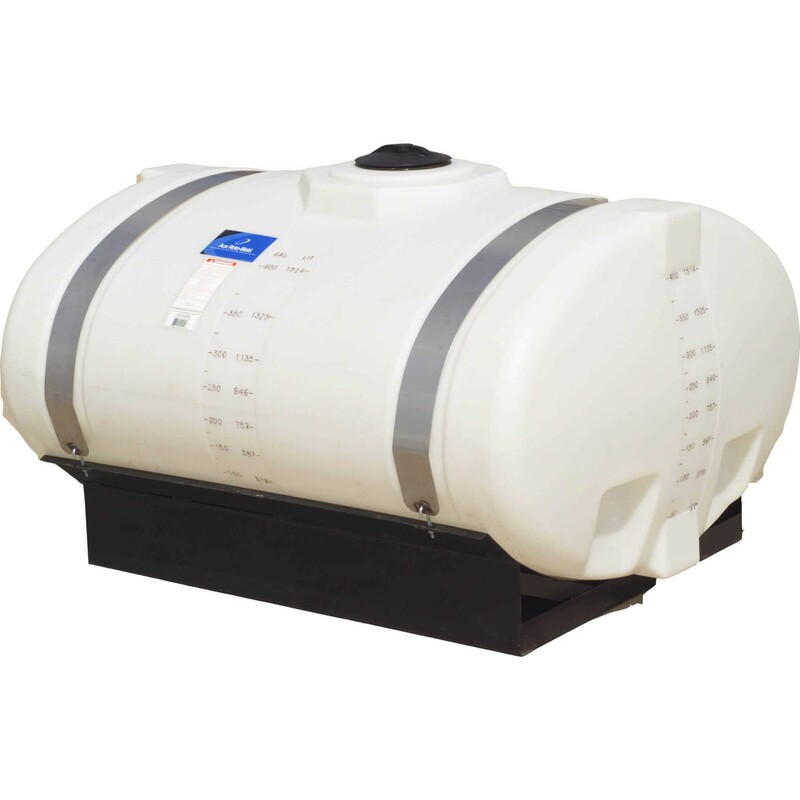 This white horizontal elliptical tank has gallon indicators located on the outside of the tank for easily viewing liquid levels. The Ace Roto-Mold 400 gallon portable skid tank has a specific gravity rating of 1.7, making it safe for chemical transportation and storage. It features a 8" threaded vented manway, 0.75" inlet, and 1.25" outlet. A skid and support bands are required to secure the cradle tank during transportation and stationary use. Ace Roto-Mold / Den Hartog backs their elliptical tanks with a 3 year manfuacturer warranty. Additional fittings and customization options are available. This plastic cradle tank is available in sizes ranging from 85 to 1,600 gallons. The National Tank Outlet is ready to help fulfill your liquid transportation needs. Contact our poly elliptical tank experts with your questions or customization requirements.